The present invention provides an apparatus and method for moving playing cards from a first group of cards into a second group of cards, wherein the second group of cards is randomly arranged or shuffled. The apparatus comprises a card receiver for receiving the first group of cards, a single stack of card-receiving compartments generally adjacent to the card receiver, the stack generally vertically movable, an elevator for moving the stack, a card-moving mechanism between the card receiver and the stack for moving cards one at a time into a selected one of the compartments, another card moving mechanism for moving cards from one of the compartments to a second card receiver and a microprocessor that controls the card-moving mechanisms and the elevator. a second card-moving mechanism between the compartments and the second card receiver for moving cards from the compartments to the second card receiver. 2. The apparatus according to claim 1, further comprising a second card moving means for emptying the compartments into the second card receiver. 3. The apparatus according to claim 2, further comprising a card present sensor operably coupled to the second card receiver. 4. The apparatus according to claim 3, wherein cards are moved from the compartments into the second card receiver in response to a reading from the card present sensor. a microprocessor programmed to identify each card in the staging area and to actuate the card mover to move an identified card to a randomly selected compartment, wherein the microprocessor is programmable to deliver a selected number of cards to a compartment; and means responsive to the microprocessor for moving the compartments. 6. The card handler according to claim 5, further comprising inputs operably coupled to the microprocessor for inputting information into the microprocessor. a second card mover for moving cards from the compartments to a second card receiver. 8. The apparatus according to claim 7, further comprising a data storage medium accessible by the processing unit, wherein the data storage medium has a program stored on it, and wherein the program is configured to cause the processing unit to cause the card moving means to move cards from the staging area to random compartments. 9. The apparatus according to claim 8, wherein the second card receiver includes a curved card way. 10. The apparatus according to claim 9, wherein the second card receiver includes a card guide means adjacent to the card way. 11. The apparatus according to claim 10, wherein the guide means comprises biasing means for urging cards into contact with the card way as the cards are moved from a compartment to the second card receiver. 12. The apparatus according to claim 8, further comprising means for monitoring, recording and displaying the use of the apparatus. 13. The apparatus of claim 12, further comprising at least one sensor for monitoring the movement of cards. 14. The apparatus according to claim 13, wherein the data storage medium is further configured to cause the processing unit to detect a card jam. providing a second card moving mechanism for moving cards from the compartments to the second card receiver. 16. The method according to claim 15, further comprising provided a processing unit for controlling the card-moving mechanism and the means for moving the stack so that cards in the card receiver are moved into random compartments. 17. The method according to claim 16, further comprising using the microprocessor to designate each card and select a compartment for receiving each designated card. 18. The method according to claim 17, wherein the designation and selection is performed before card moving operations begin. a processing unit programmed to control the first card mover and the movement of the compartments, wherein the processing unit randomly assigns each card in the stack to a compartment, and controls the second card mover. delivering cards in a compartment to a dealer upon demand. 21. The method according to claim 20, wherein between seventeen and nineteen compartments are provided. 22. The method according to claim 20, wherein the group of cards is a deck of cards selected from the group consisting of a standard 52 card deck, a standard deck with one or more wild cards, a standard deck with one or more jokers, a special deck and a partial deck. 23. The method according to claim 20, wherein every card in the group is assigned to a compartment before the first card is delivered. 24. The method according to claim 20, wherein nineteen compartments are provided. (d) a first card moving mechanism, operably connected to the microprocessor, for moving a card from the card receiver to a selected compartment; and a compartment moving mechanism, operably connected to the microprocessor, for translating the compartments. 26. 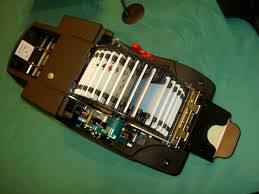 The apparatus of claim 25, further comprising a second card receiver for receiving cards from the compartments. 27. The apparatus of claim 26, further comprising a second card moving mechanism, operably connected to the microprocessor, for moving cards from a selected compartment to the second card receiver. (d) unloading a compartment to the second card receiver when the compartment has received a predetermined number of cards. (b) wherein each card compartment comprises a plate member that includes a beveled surface.